in winter) That sounds pretty straightforward, doesn’t it? the mid 1800s. Before then, hay was just a loose pile of dried grasses or grain stubble. Not very compact, and very easy to make a mess with. When the hay was harvested, it was piled up in big haystacks in the fields. Then, they came along with huge wagons, and used pitchforks to put the hay up onto the wagons. The wagons were taken to their stables, and the wagon was actually driven inside the building, where men stood on the back of it and used the pitchforks again, to ‘pitch’ the hay up into the hayloft, which was basically a big empty second storey over the stables. Why did they store it up in a loft, instead of at ground level? It was easier to keep tidy when it was constrained in a building. The only disadvantage to this, is that a loft full of hay is a rather large fire risk – so care had to be taken, in an era when lights at night were candles. So, next time you are reading a Regency story, and someone goes to feed the horses, spare a thought for the fact that they had to climb up into a loft, shovel great piles of loose hay down through a hatch, then pick it all up in loose bundles to carry to where it needed to be. (And loose hay is itchy scratchy stuff….). Nowhere near as easy as cutting the strings on a neat square bale, peeling a single ‘biscuit’ off and carrying that! Today, the first thing that comes to mind when asked “What’s paper made from?” is ‘Trees’ or ‘Wood’. People assume automatically that paper is made from wood, that paper and wood are synonymous. or kids. It was, as a result, very expensive, and in limited supply. Once the idea of making paper from linen, cotton, hemp and similar fibres really took hold (it was introduced to Europe around 1000 from China, by way of the Arab nations), it spread slowly. Rag based paper existed in England from around the 1300s, but the scale of production was small. By the mid 1700s, the demand had risen so much that rags were worth a great deal of money, and there were laws in parts of Europe forbidding trade in rags outside national boundaries (so, of course, people smuggled them). The demand drove change. Throughout the eighteenth century, there was an intense search in Europe and the U.S. for a new fiber source of paper. Contests were held, universities offered prizes, and inventors and laboratories worked feverishly to come up with a new source for paper. Inventors would often print a book on their newly-invented paper that described how the paper was made. And so we ended up with books printed on paper made from asbestos, straw, swamp grass, marsh mallow, and esparto dune grass from certain beaches in Spain. In the early 1800s the crisis in demand for rags was made worse by the progressive invention of better printing presses, and the rising demand for books from the wealthy classes. The first patent for a paper using deinked waste paper as part of its fiber source was issued in 1800 in London. It was not until the 1840s that the initial development of the papermaking machine in England and experiments in ground wood pulping in Germany and Nova Scotia enabled the commercial production of paper, which used wood fibre as part of its composition. So – when your read about books in Regency stories, or about characters pulling out a sheet of paper to write on, those books and writing papers are made of rag fibre, and are very expensive. No-one wasted paper, unless they were unbelievably wealthy. This is also why letters of the time were often ‘crossed’ – (see image above) where the writing was written on the page in one direction, and then the paper was turned 90 degrees and the person continued writing in lines which ‘crossed’ the first loot of writing – all to save paper. Which made it remarkably hard to read what your correspondent had to say! (and has made it extraordinarily difficult for historians to transcribe the letters of historical figures, even when they are well preserved. So next time you scrunch up a sheet of paper in frustration, throw it away, and start again, consider that, in the Regency era, you would have been throwing away what could amount to a month’s wages for a poor person! the Regency era, whilst some decorations made form paper and other items were beginning to be used, by far the greatest amount of decoration was still greenery. Most Christmas greenery, whilst often originally used in non Christian or pre-Christian cultures, when adopted by Christian countries was imbued with a Christian meaning. many of these meanings related to the ability of the evergreen plants to survive through the harshness of winter. 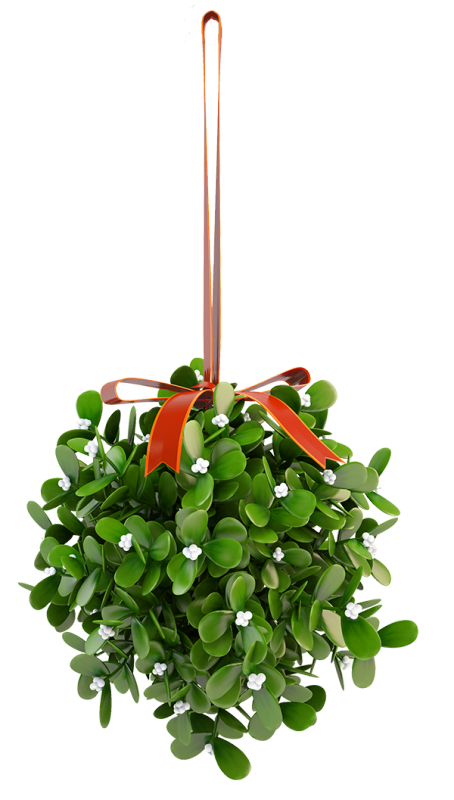 Holly – The prickly leaves represent the crown of thorns that Jesus wore when he was crucified. The berries are the drops of blood that were shed by Jesus because of the thorns. In Scandinavia it is known as the Christ Thorn. In pagan times, Holly was thought to be a male plant and Ivy a female plant. An old tradition from the Midlands of England says that whatever one was brought into the house first over winter, tells you whether the man or woman of the house would rule that year! But it was unlucky to bring either into a house before Christmas Eve. Ivy – Ivy has to cling to something to support itself as it grows. This reminds us that we need to cling to God for support in our lives. In Germany, it is traditional that Ivy is only used outside and a piece tied to the outside of a Church was supposed to protect it from lightning! Laurel, Fir and Yew, Rosemary and many other plants were all also allocated meanings in the context of the Christian faith and Christmas. So, in Regency times, decorating your house with Christmas greenery was also a statement of your faith in God, and a sign of your family’s adherence to the church. remarkable, and worth quite a fortune. longer book was much fatter. To make the process of printing easier for the printers, rather than print one page at a time, multiple pages were printed on one huge sheet, (which was printed both sides, to a very cleverly planned pattern, so that all of the pages ended up in the right order after folding) and the result was folded in a specific way down to the individual page size. Each bundle of pages was stitched down the fold that aligned with the spine of the book. (which is where the process that some note books are still made by today came from). This meant that, when the book was assembled (each bundle stacked on the others in the right order, and the whole stitched together across the width of the spine), either a top of bottom edge, or the opening long side of the book had many instances where the pages were still joined together, by a fold (which side these ‘unopened/ uncut pages were depended on the fold pattern used). 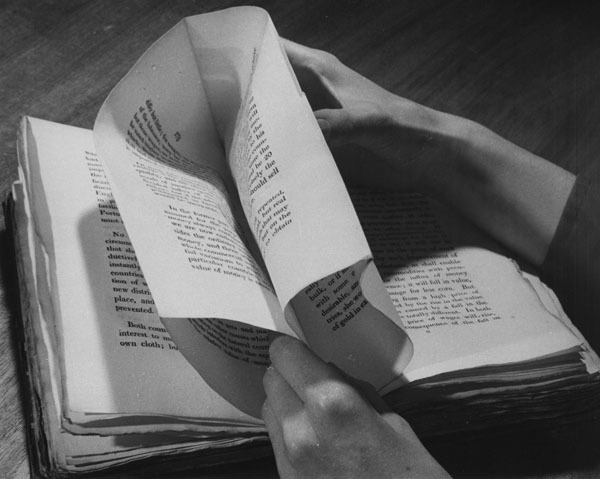 To be able to read the book, you needed to take a sharp flat paper knife, and slice along the fold to separate the pages (see picture above to understand what this looks like. The book in the picture has closed folds at both the right hand side of pages and the top of pages.So, when you see a very old book, with rough and a little uneven edges, it is likely because whoever cut the pages did so not so evenly or smoothly. Books were also often first sold to a buyer with their pages rough edged, most uncut, and in a temporary light cloth binding. The buyer then took the book to a binding specialist, to get a good quality leather binding in the color and texture of their choice made, and the pages bound into it. So… next time you read a paper book, imagine being there in the Regency Era, and having to keep slicing the pages apart, the first time that you read a book, just so that you could turn the page! How Did They Fasten Their Clothing? Every day, we put on our clothes, and take them for granted, yet so many things about them are amazing. The number of different ways that we have to fasten them, for a start. Most of which did not exist in the Regency Era. You can start to see how that might limit things. And that no elastic thing… that means no stretch fabrics either. Some fabrics were flexible, with some give inherent in the way that they were woven, but most were completely non stretch in all ways. So – what did they fasten their clothes with ? They actually had quite a choice – but all of these options were fiddly, and many, like pins and brooches, were pointy and quite likely to stick into the wearer if they moved the wrong way! It was not uncommon for a ladies gown to be cut to so close a fit in the bodice that she was pinned into it, or actually sewn into it when she put it on to wear! That sort of thing gives you an insight into why ladies of the nobility needed ladies maids to help them dress! Equally challenging, was a dress where the firmness of fit was achieved with a row of very closely spaced small buttons down the back. That would be hard enough to do up by yourself at the best of times, but, when you were already wearing stays or corset, which rather changes what movements are easy, it became almost impossible to do for yourself. Next time you look at a picture from the Regency Era, look closely – can you see how the clothes are fastened? Next time you get dressed yourself, consider how your clothes would be, with no elastic, no press studs, no zippers and no Velcro – would everything you own no longer work? When reading your favourite books, this may make you look at the heroines in a new light!. You’ve probably all heard the term ‘The Industrial Revolution’ at some point in your life, but you may not realise just how much of that revolution was happening in Regency times. The Industrial revolution was a period when much manufacturing which had previously been done in homes, as ‘cottage industry’ began to move into more factory style bulk production. This happened for a number of reasons. greatly enhanced the productivity possible from a single worker. 2. The Napoleonic wars, like any war, required a great deal of supplies to keep soldiers in the field – not just food, but uniforms, weapons and ammunition. The protracted series of wars (from 1790 to 1815) drove innovation in manufacturing, both because merchants wanted to profit from being a supplier to the military, and because so many young men had gone to war that efficiencies were needed to get anything made, as there just were not enough workers in some areas. 3. The appetite of the English aristocracy for high quality and exotic goods, for conspicuous display of wealth, drove merchants to look for new and more effective ways to provide what they wanted to buy – from new types of fabric, produced in the new weaving factories, to other items which had become more scarce as the wars affected the ease of trade. 4. The increasingly innovative use of steam engines (to drive things like factory machines, as well as the trains for the railroads which were starting to be built) provided a more economic method of creating rapid production, and the railways began to make fast distribution of goods possible. Put all of that together, and you have a recipe for rapid change. Change that brought good things and bad. Machinery allowed the manufacture of much more high quality cloth, and more complex patterned cloth, using the new Jacquard weaving looms, and for many new items, such as machine produced greeting cards. But machinery in factories was a new thing – a thing that could be very dangerous to workers, in an era where there were no laws protecting those workers (It was more than a century later, before the idea of Occupational Health and Safety was invented….). 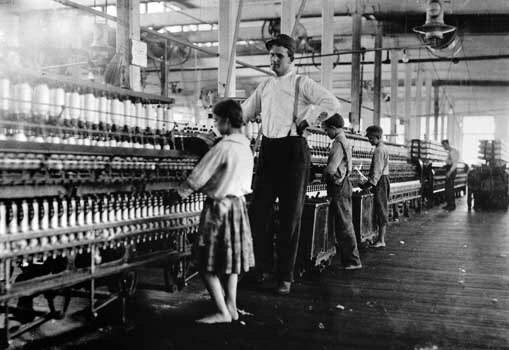 In the weaving shops, small children were often employed because they could get under machines, and get their hands into tiny spaces to untangle things – many were crippled or killed when machines broke or trapped them. The advent of machine tools also allowed greater standardisation in production of items – which made things cheaper – what had previously been handcrafted and only available to the rich, could now be bought by the lower and middle classes. The change in standard of living this created was the beginning of a great destabilisation of the distribution of wealth, and the sense of ‘knowing your place in the class system’ of the world. Until our Regency period, it was a world where almost every item was made by hand, was unique, and not quite the same as the next one, and took much time to make. Imagine how different such a world was! And how exciting, and terrifying, the rate of change must have seemed, when machines began to be possible, and mass production came into existence. Dancing – What dances did they do? staying vaguely with whoever they are dancing with. If we think of something more than that, then we think about more formal ballroom dancing, or maybe things like Jive or Swing, or Latin American dances. All of which usually involve being in close contact with your partner, all the way through the dance. Yet, you may have noticed that how dancing gets described, in the better, more historically accurate regency books, is nothing like that. 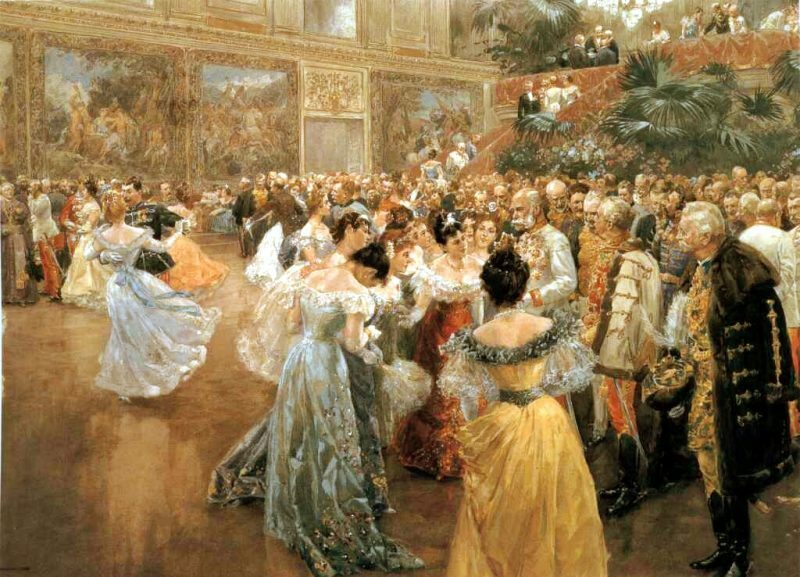 There are many books that talk about the waltz as being ‘scandalous’ – has that puzzled you? Have you wondered why? Well, that’s what today’s trivia is about. It was regarded as scandalous because to dance it, especially if the ladies gown was rather long and easily tripped on, without falling over, the gentleman had to have a firm hold on the Lady, who had to be, therefore, scandalously close to his body, front to front. The theory was that there should still be at least 12 inches between them – but, let me assure you, doing a Viennese waltz When you are that far apart is almost impossible! So, naturally, people danced closer together – which led to scandalous body contact, whisperings in ears, the chance for the gentleman to move his right hand rather further down the lady’s back than was strictly good form for the dance, but which allowed him to tough parts of her that he could never hope to touch otherwise! So – what were the other dances like, if a waltz in close contact was so shocking? Other dances of the time came from two different heritages. One was the very formal court dances which had been around, and evolving, for centuries – dances like the minuet (which most people have heard of). The other was what are called ‘country dances’, like the cotillion – these are also, like the court dances, pattern dances, where there is a lot of progression, stepping around your partner, being passed up and down a line of partners etc etc, but, in the country dances, things tended to be a lot more energetic and ‘bouncy’ in style (which could also lead to wardrobe malfunctions and torn flounces on hems etc.) These dances rarely had the partners do more than touch hands, to pass around each other, or from one partner to another – hence they were less scandalous. So – next time you read a regency story, and the author talks about dancing, stop and think – is what they are saying accurate? or has their unconscious modern set of assumptions snuck in and affected what they have written? Why Was It Called ‘The Season’? Most Regency romance stories feature ‘The Season’ in some way. But… Have you ever thought about why it was called that? records from the period), there are a few things that we know. When the men of the nobility came to town to do their parliamentary duties, they brought their families with them. And, mostly, everyone stayed in town through much of winter, and right up until some time in June, when parliament usually closed. All of those family members, who did not have to be in parliament, needed something to do! So began the tradition of using that time to entertain each other with Balls, outings and other social occasions. Everyone was competing with everyone else to show how sophisticated and wealthy they were, so things became more and more elaborate over time. Along with that, quite early on, the intelligent mothers of the nobility realised that the grand cycle of glittering events was the perfect hothouse climate for fostering emotional attachments or carefully cultivated marriage proposals. So what began as entertainment soon developed a much bigger purpose. If you were going to spend the amazing amount of money that it cost to entertain during the season, you might as well make sure that the best possible marriage for your children resulted. So, because it all happened each year, people needed a way to refer to it – and the concept of ‘The Season’ was born. 2. As a contraction of ‘the entertaining season’ – the season in which everyone entertained. So – we can’t really know for sure, exactly who first called it ‘The Season’, but we do definitely know that it all came about because families were stuck in London in winter (when the roads were in terrible condition and travel was difficult) and needed something to do! story told, and it is uncertain which are true, but the core of today’s Valentine’s Day traditions, and those engaged in during the Regency period, go back to one element of the stories told. According to those stories, whilst imprisoned, Saint Valentine wrote letters to a woman that he had come to love, and signed them ‘your Valentine’. Everyone loves a good story, and through the centuries the whole thing was romanticised. In the 1600s and 1700s people began to give love favours and small gifts on Saint Valentine’s Day, and by the Regency period, that had become a very common thing to do – mainly men giving favours to the women that they were courting, or to their mistresses in some cases. It was less common amongst those who were already married. At that point, the favours and tokens given were all hand made, and could be of any style or construction – it was the thought behind them that mattered. In the early 1800s it became more common for a favour to include, in some way, poetry. Cards decorated with lace and ribbon were made by hand, often by the giver. Around 1815 or so, enterprising people saw the opportunity, and began to mass produce those cards, still, initially, by hand. Rapidly after that, however, machine made cards came into existence, featuring things like machine cut paper lace. These became called ‘mechanical valentines’. The advent of more affordable and reliable mail services in the early 1800s, in combination with ‘mechanical valentines’, allowed a massive expansion of the giving of the cards – with hundreds of thousands of them being posted around the date of Saint Valentine’s Day each year by approximately 1820. As machine made, mass produced cards became easily available, the hand made, beautifully decorated versions became a more exclusive product, reserved for those who could afford to pay for that level of quality. In some ways, it is surprising how much the ‘commercial’ aspects of the Regency Saint Valentine’s Day celebrations resemble those of today. In other ways, we can see that the Day was still seen as more of a religious holiday (and was still called Saint Valentine’s Day), and that the way that it was celebrated was limited to the giving of cards or favours. It is a fascinating time in the evolution of the celebration, as the concept of mass produced cards began to drive a commercial approach. 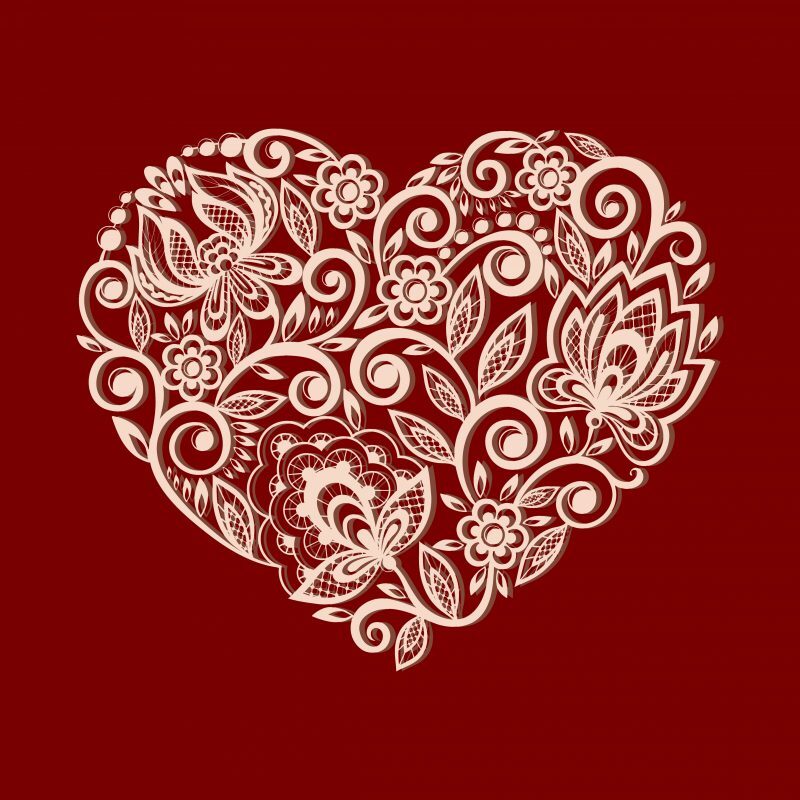 If you had lived in the Regency period, consider – how would you have celebrated Saint Valentine’s Day? Christmas Trees – were still pretty much unknown in England, with the first having been introduced by the German born Queen Charlotte in 1800. The upper aristocracy did take up the idea, as copying the royal family was always seen as good form, but the tradition of a decorated Christmas tree was slow to spread. Decorations, if there were any, were likely to be edible – gingerbread men, small cakes, sweets tied in paper etc. There were some indications that other paper decorations did sometimes occur, but we have no detailed evidence for them. Other Christmas Decorations – were mostly greenery and berries. Greenery used, apart from pine boughs, was rosemary, bay, holly, laurel, and mistletoe. This was a longstanding tradition, going back to medieval times and earlier. There are references to kissing under the mistletoe as early as the late 1600s as well. Christmas Traditions – in Regency times, many of the older Christmas traditions had fallen out of favour, being seen as rather unsophisticated, but many of the country people still held to them. This included the concept of the Yule Log, or Christmas Fire, and the wassailers – people who went from house to house, singing and pretty much begging for food and drink in return. The Christmastide was the period from Christmas Day to Twelfth Night, and celebrations might happen across the whole period. Much less importance was placed upon the gathering of family at this time of year then, than is now. Christmas Food – There were very few, if any, foods that were regarded as especially for Christmas – it was more about having good food in general, and being charitable, by sharing that with neighbours, and with the poor. So – there is a quick summary – rather flat compared to some of the Christmas extravagance that we see today, isn’t it! The important things to see here, are that the royal family instigated changes in what was done, the poorer and country people were more likely to celebrate than the aristocracy, and the aristocracy who did celebrate were likely to do charitable deeds as part of it. As you enjoy your Christmas, consider – who would you rather have celebrated Christmas with, in the Regency period? "A GIFT OF LOVE" (Prequel to The Derbyshire Set series) and "MADAME'S CHRISTMAS MARQUIS" (A story in the His Majesty's Hounds Series) Only available here! Get free newsletters about Arietta's books, new releases, new books from Arietta's friends, giveaways, special deals, free stories and amazing information about all things Regency. GET TWO EXCLUSIVE FREE BOOKS! "A Gift of Love" (Prequel to The Derbyshire Set series) and "Madame's Christmas Marquis" (A story in the His Majesty's Hounds Series). Only available here! Don't miss your exclusive opportunity to read 'A Gift of Love', the prequel to the Derbyshire set series, and 'Madame's Christmas Marquis' a story in the His Majesty's Hounds series, only available here. Fill in the form to download your copy now!